Growing concerns about wealth inequality and the expanding racial wealth gap have in recent years become central to the debate over whether our nation is on a sustainable economic path. 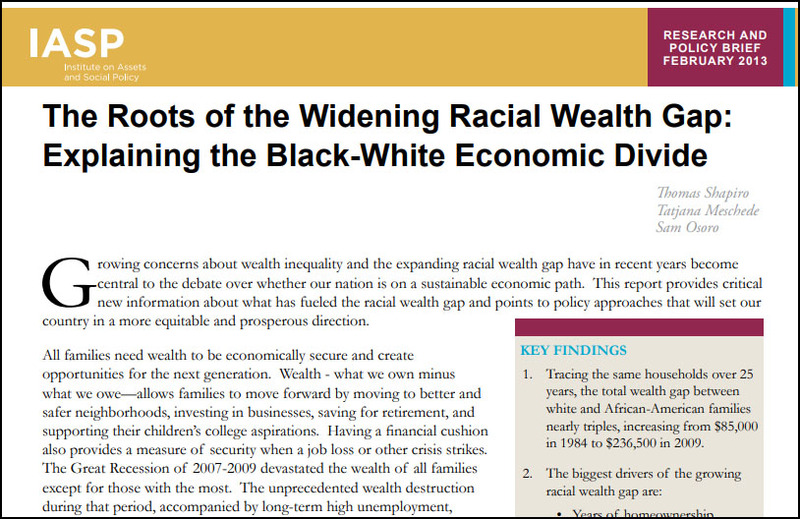 This report provides critical new information about what has fueled the racial wealth gap and points to policy approaches that will set our country in a more equitable and prosperous direction. All families need wealth to be economically secure and create opportunities for the next generation. Wealth – what we own minus what we owe—allows families to move forward by moving to better and safer neighborhoods, investing in businesses, saving for retirement, and supporting their children’s college aspirations. Having a financial cushion also provides a measure of security when a job loss or other crisis strikes. The Great Recession of 2007-2009 devastated the wealth of all families except for those with the most. The unprecedented wealth destruction during that period, accompanied by long-term high unemployment, underscores the critical importance wealth plays in weathering emergencies and helping families move along a path toward long-term financial security and opportunity. Extreme wealth inequality not only hurts family well-being, it hampers economic growth in our communities and in the nation as a whole. In the U.S. today, the richest 1 percent of households owns 37 percent of all wealth. This toxic inequality has historical underpinnings but is perpetuated by policies and tax preferences that continue to favor the affluent. Most strikingly, it has resulted in an enormous wealth gap between white households and households of color. 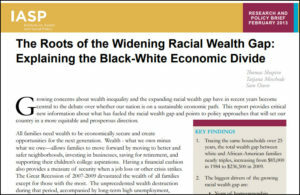 In 2009, a representative survey of American households revealed that the median wealth of white families was $113,149 compared with $6,325 for Latino families and $5,677 for black families.